An artist's representation of radio waves from a distant quasar, called B0218+367 (seen far right). On their way to Earth, these waves pass through a spiral galaxy containing ammonia gas, which absorbs a portion of the radio emission. Unlike most of us, subatomic particles don't gain weight asthey get older. The mass of these tiny bits of matter has remained constantover the last 6 billion years, recent astronomical observations indicate. Believe it or not, but whether an electron was lighter orheftier in the past is a question of fundamental importance. Variations inparticle masses and other so-called constants of nature, such as thespeed of light, may help explain the mystery of darkenergy and determine if hiddendimensions exist. "Some theorists claim the physical constants shouldhave varied over time," said Christian Henkel of the Max Planck Institutefor Radio Astronomy in Bonn, Germany. "This is something that is part ofthe modeling of the universe." Henkel and his colleagues have placed new limits on waveringconstants. By observing the absorption of radio waves by molecules in theearly universe, the researchers have shown that the mass ratio between twoparticles ? the proton and the electron ? has not changed from its presentvalue by more than 2 parts in a million. The results, reported in a recent issue of the journal Science,call into question previous measurements that claim to have seen variations inthis mass ratio. Henkel came to study varying constants after he and somecolleagues detected ammonia in a galaxy "halfway across theuniverse," he told SPACE.com. Such a faraway object offers aglimpse back in time, because the light we see from it now left the galaxybillions of years ago. It was the first time this molecule had been seen so faraway. 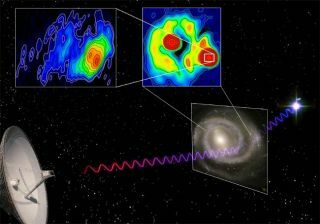 The team identified the ammonia by its absorption of radio waves from a brightobject called a quasar, located behind the galaxy. Only later did they realizethat this absorption could provide information about the fundamental physics inthe early universe. "Ammonia is a molecule with a very specialstructure," Henkel explained. It looks like a pyramid (or tetrahedron)with three hydrogen atoms forming the base and one nitrogen atom on top. Although most other molecules rotate faster when they absorbthe energy from radio waves, ammonia actually flips inside out, with thenitrogen moving from above the hydrogens to below. This flipping depends strongly on the ratio between the massof the proton and the electron. Knowing this, Henkel's team compared theirammonia data to other molecules in the same galaxy and found the ammoniaabsorption had not significantly shifted from where it was expected to be. The implication is that 6 billion years ago, protons weighedroughly 1,836 times more than electrons, just as they do now. "It is a puzzling result, but I am sure they did athorough job," said Wim Ubachs of Vrije University in Amsterdam, TheNetherlands. Ubachs was one of the astronomers who wrote a 2006 research paperthat claimed to see a change (20 parts in a million) in the proton-electronmass ratio. The experiment was similar to the current study, but in this casethe molecule was not ammonia, but hydrogen.? At face value, the two observations disagree, but Ubachspointed out that his group's results correspond to a much earlier time, morethan 11.5 billion years ago. It is possible that the mass ratio changed in between thetwo measurements. Indeed, there are theories that the fundamental constantsvaried after the Big Bang but then stopped once dark energy (a hypotheticalenergy that produces a force that opposes gravity) began acceleratingthe expansion of the universe some 6 billion years ago. Some of thesemodels claim that dark energy is somehow responsible for variations in theconstants. Others, based on string theory, assume that extra spatial dimensions(beyond the three we can see) cause the constants to fluctuate in value. To prove any of these wild ideas will take a lot more data;both Henkel and Ubachs have fresh observations that are in the process of beinganalyzed. "We hope that the upcoming results will shed more lighton the issue, which is very intriguing indeed," Ubachs said.